Today’s feature Sun City Festival floor plan is the Spirit model. At just under 1,400 square feet, the Spirit floor plan is a more modestly sized home but makes the most of its space with an open great room, 2 bathrooms and 2 bedrooms with a den that can easily be converted to a third bedroom. Given this floor plans smaller size, it’s also a less costly option for those considering a Phoenix area active adult community home in Sun City Festival. As with many of the 14 unique floor plans in Sun City Festival, the Spirit floor plan features many lovely upgrades including appliances, exterior brick pavers and more. 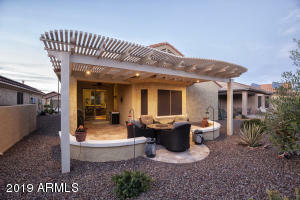 For more information on Sun City Festival homes for sale, feel free to fill out the form below the listings or give me a call – 602-317-6298. Remember, I’m not just a local Sun City Festival real estate agent, I’m also a resident and would love to show you around and answer any questions you may have.